Clean the silver skin and thick fat of the lamb. Put the lamb shoulder, olive oil, salt and thyme in a bag and vacuum on high. Cook sous vide for 18 hours at 60 °C. Cool in ice bath or blast chiller. Carefully debone without damaging the meat. Separate the muscles by hand and cut into 60 gr pieces. Vacuum pack the portioned meat pieces on medium (4 ea/bag). Keep in cooler. Soak the bulghur in warm water for 20 minutes. Wash and strain the bulghur. Sweat the onion in olive oil in a small sauce pan. Add bulghur to the pan and stir 5 min over low heat. Add tomato sauce and the peeled and diced tomato to the pan. Stir over heat for another minute. Add salt, pepper and boiling water. Close the lid on top of the pan and simmer 15 to 20min. Add sumac and carefully fold it into the cooked pilaf. Allow to rest in a warm place at least 1 hour before service. Slice the pestil and add to a small sauce pan. Heat and add the water on top, cover the pan with cling film. Rest 15 minutes until the pestil is dissolved. Pour the lumpy mixture into the Thermomix and add the pomegranate reduction. Blend at lowest speed with 100°C set for 5minutes until smooth and shiny. Blend at fastest speed for 1 minute. Pass through a tamis. Keep lukewarm until service. Crush the tarhana base in a mortar until crumbly. Put it in Thermomix and blend 1 min on max speed to a fine powder. Sieve the powder (45gr Powder, 5gr Bulghur) and discard the tiny bulghur. Put the sieved powder back into the Thermomix and add water, lamb stock, and both chili pastes. Cook 5 min at 100°C at lowest speed. When cooked, blend 90 seconds at full speed. Pass through a tamis and place a cling film on top to prevent contact with air. Keep warm until service. Strain the yoghurt with a coffee filter (the final weight of the thick strained yoghurt must be 350 g., use more natural yoghurt if necessary into yoghurt). Put the yoghurt in a mixing bowl, add salt and mix with a whisk. In another mixing bowl whip the cream thick and fold into the salted yoghurt. Keep refrigerated until service. Reheat lamb to 60 °C. Open bag and sear the meat on one side. Spoon some tarhana cream on the plate. Arrange the lamb on top. Put the pilaf in a small mold / circle. Sprinkle a few leaves of thyme on the lamb. 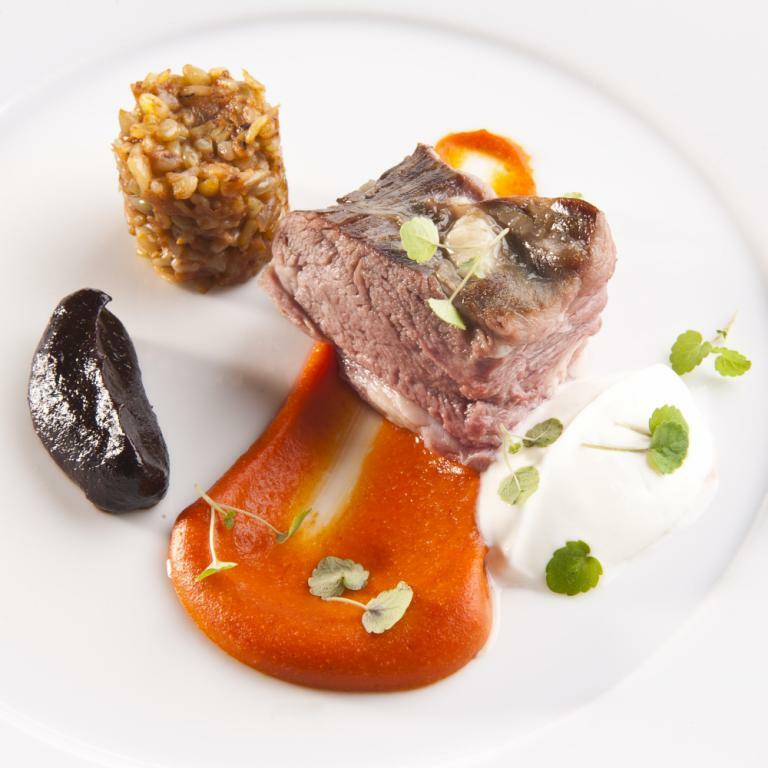 Make a quenelle of the plum reduction and put next to the lamb. Make a small quenelle of the yoghurt and put on top of the meat. Arrange herbs and sprouts on the plate.